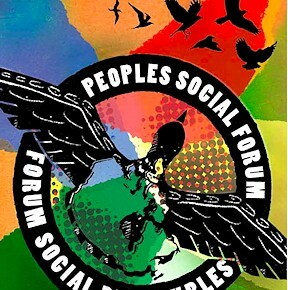 This week, I’m at the Peoples Social Forum in Ottawa. It’ll be a huge love-in produced by, for and about like-minded lefties from across Canada and beyond. Hyped as a “historic gathering of movements,” it’s a clarion call to action by the left in this country with plots hatched and schemes schemed for the demise of the Harper Government(TM) and other nifty things that may lead to this country’s slow return to sanity. If it doesn’t show already, I’m a mite skeptical. I’m allowed. It comes with the territory — as both a Mohawk and a journalist. My “spidey sense” goes off whenever I think anyone’s trying to nudge people into groupthink. Call me a contrarian, but I tend to be repelled rather than attracted in such cases. But then, I’ve had plenty of good and bad experiences with similar events. 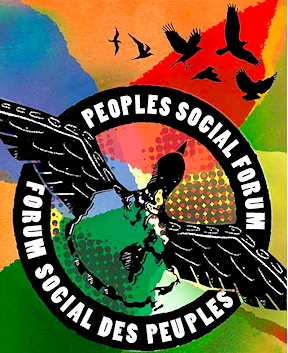 If the Peoples Social Forum succeeds, it’ll be because people come here not as mindless cheerleaders waving pom-poms but as muckrakers with hard questions and healthy skepticism. If the Forum fails, it’ll be because people came so they could confirm their own assumptions, reaffirm their own sense of righteousness, and feel comfortable in their own prejudices. It’ll fail because folks came to tell people (or have folks tell them) what to think and what to do to advance their cause. And it’ll fail if they forget to question. As for yours truly, I think I’ll see what this bro-mance between Indigenous types and these lefty socialists and fellow travellers is all about. What a change from the old days when we were expected to sit at the back of the room and stay quiet while the grownups did their business. Now, we’re all over the place. We lead workshops and open events and sing and dance and wear feathers and everything. Which gives me a shiver or three so I’ll stop talking about that aspect of the Forum, if you don’t mind. I’d also like to see what the ‘alt media’ types are doing. Have they come up with a way to stop being the broccoli of journalism and instead strive to be must-reads? Or are they still looking for a way to be read and popular but not so much that they turn a freaking profit. OMFG!! The horror. The horror. I also intend to be entertained by the anarchists who have an “Anarchist Welcoming Committee” helping put together this Peoples Social Forum. Note the clever choice of “Welcoming” instead of “Organizing” or “Planning” because, well, that would be so contradictory. Doncha think? I promise to drop by the book launchings and speechifying and rub elbows with the stars of this four-day gathering of the lefty universe in Canada. No, I won’t be asking for autographs. Apparently, hero worship is not a lefty thing unless the hero is dead. Of course, heroes of the struggle can’t sign autographs post-mortem although I know of a few who might have tried. I also promise to drop by the pow-wow on Sparks Street. Just where I thought it should be. Right there on the hot pavement between the CBC and D’Arcy McGee’s Irish pub on the verge of Confusion Square. Oh yeah. Looking at the Official Program, you see so many interesting workshops going on at the same day, same time and, interestingly, on opposite ends of this downtown campus. I went through the 48-page document, page by page, item after item, collating and copying and pasting all the things I found interesting or “must-see”. I wound up with 14 pages of stuff. Oy vey! Now comes the hard choices and deletes. Should I attend an anti-pipeline panel? Or go for the “win back your community TV” thing waaaay over there on the other side of the U of Ottawa? What about that speaker at noon in the “Peoples Square”? Shouldn’t it be renamed Red Square? If I go, will I be scanned for impure thoughts? Of course not. It’s not the Catholic Church, after all. But I digress. Hope to see y’all here. If not, then stay tuned for the further adventures of a poor wayfarin’ Shmohawk in LeftyLand, coming soon to a blog near you.